Over the past few years, organizations have focused a lot of time, energy, and resources on designing, implementing, and improving their GRC capabilities. As a result, many executives are starting to ask, “Is all of this work really working? 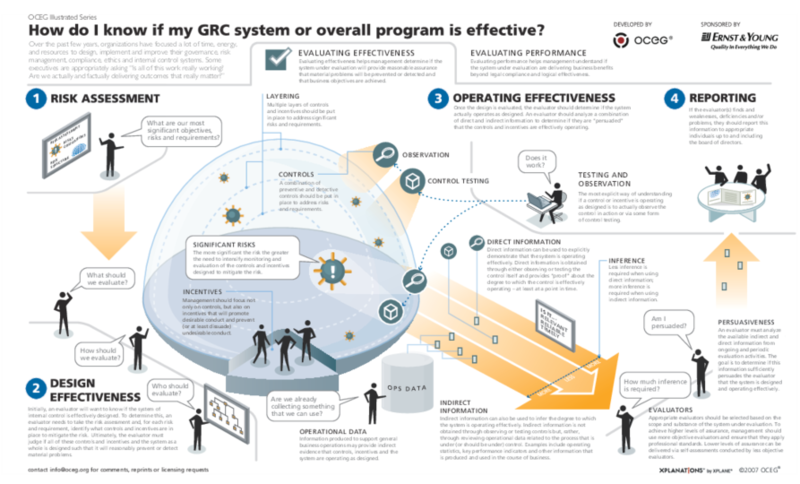 Are we actually and factually delivering outcomes that really matter?” This illustration can help you evaluate the effectiveness of your GRC capabilities and communicate improvement plans with your teams and stakeholders. We have emailed instructions to access Illustration – How Do I Know If Our GRC System Is Effective to . Make sure the email arrives in your inbox: either add "support@oceg.org" as a safe sender to your email platform, or if you use Gmail, drag our email into your Primary tab.